May 8, 1985 Kevin E.
But wait – here is proof positive that some of us didn’t put away our childhood pleasures and move on to the big, bad, boring world of nine-to-five adulthood. 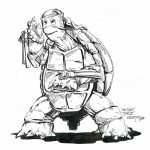 Peter Laird and Kevin Eastman, from their Mirage Studios in Sharon, Connecticut, are two lost souls who have taken their superhero fantasies to heart – not to mention all the way to the proverbial bank. 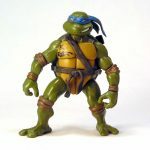 They are the co-creators of Teenage Mutant Ninja Turtles, currently the hottest title in the entire field of caped crusaders and masked righters-of-wrongs. Although the book has been in existence for only a year, the initial printing of the first issue is already being offered by collectors for a cool $75. With three issues published so far – and available solely by direct mail and through specialty comic book shops – Eastman and Laird are about to crack into the Big Time. According to Eastman, the pair did indeed study current trends in mass market comics, then ingeniously melded them all together, with just a touch of parody laid in for good measure. But could they recall the exact moment when this incredible fusing of elements came together to form what may be the neatest cult creation since Howard the Duck? Claiming that one could not work successfully without the other, Eastman and Laird (as they are billed above the title of their comic as its true auteurs) handle the entire production of the book, from start to finish. And as the sole owners and employees of Mirage Studios, from start to finish entails exactly that: from buying the art supplies to writing the script to doing the artwork to putting the completed book into the mailing envelope. Each issue takes about five weeks to complete, though both artists admit they are far from what is traditionally thought of as a comic book production line. “We average about a page and a half a day, for finishing work,once we get the pencils done,” explains Laird. “It’s the inking that takes the longest time. But it does go pretty fast, with both of us working on it.” One reason they get as much done between them is because, when one gets bored with a particular element of the production, they can just switch over so that the other can deal with the work with fresh insight and energy. Regardless of their humble beginnings, fame and fortune appear to be fast overtaking Eastman and Laird. 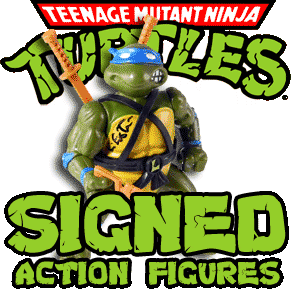 Their Mirage Studios is offering 25-mm metal miniatures of each turtle in an appropriate action pose, as well as full-color T-shirt iron-ons of both the turtles and their title logo. (For further information, write Mirage Studios, PO Box 1218, Sharon, Conn. 06069. 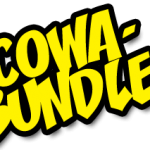 Back issues of the comic are available for $2.00 each, postpaid.) A Dungeons and Dragons style role-playing game from the Palladium company is scheduled for release this fall. 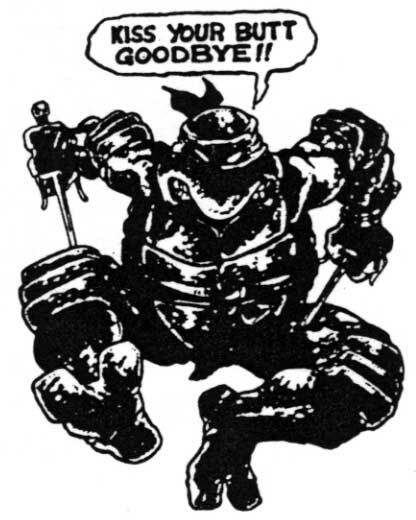 At this rate, it is not too far-fetched to think that the turtles will be in their own mass market edition someday, and who is to say an animated Saturday morning TV series is not out of the real of possibility? 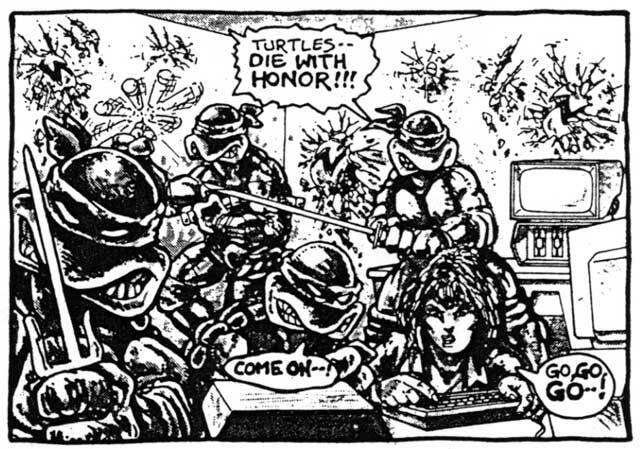 No one, however, is more surprised at the success of the turtles that their creators. 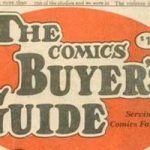 “I think we’ve set a record for rapid rise in price for any comic book over a rear’s time,” says Laird, with more than a trace of awe in his voice. “We’ve heard of autographed first editions going for $100 at comic conventions,” adds Laird, shaking his head in amazement. 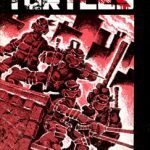 Rest assured, more issues – with much larger print runs – are being made available to the ever growing fandom of the turtles. 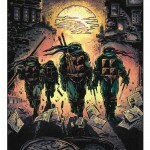 Future plans to call for the Teenage Mutant Ninja Turtles to be in full color, but for now the two artist-writers are being careful to take their new-found success both slowly and selectively. They have just begun to become part of the comic convention route, where they are rubbing shoulders with the major talents in the field when, only a few short years ago, they would have been satisfied with just getting their autographs. 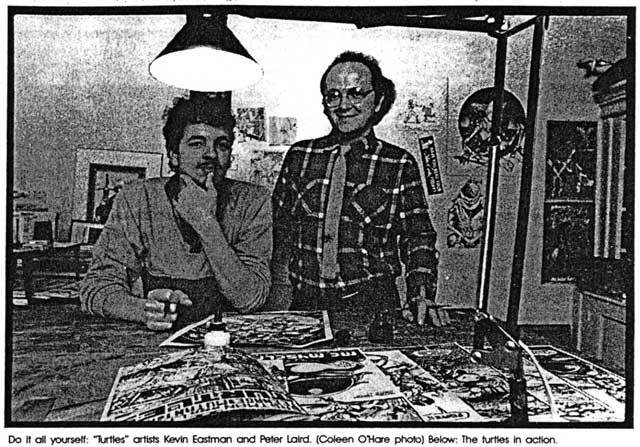 Yet the fans of all ages who crowded into Funtasy Fantasy to obtain original sketches and their autographs, further proved that Peter Laird and Kevin Eastman are no longer dreamers – on the outside looking in. For all intents and purposes, they have made their fantasy become their reality. While declaring that it is almost impossible to break into the professional comics field, whether independently or with the major publishers such as Marvel or D.C., the bottom line remains that they never really thought of doing anything else with their lives. Both have already paid their dues, and have the stacks of rejection slips as evidence.